At the beginning of April the Ramsay Archives welcomed Anita Harris’ fifth grade class for a session on one of our treasured primary sources, a letter from George Washington. This letter was given to Wabash College by Bill Hays’ mother in the 1950’s. We know that it is authentic because Bill graciously paid to have it authenticated for the college. The gifts of time, talent and treasure given to this old college by the Hays family are a subject worthy of a long post, but I do want to share the delight that this particular gift inspired in our visitors. My daughter Betsy is a student in Mrs. Harris’ fifth grade class and they are studying the Revolutionary War. During class, Betsy mentioned that we had a letter from George Washington. Anita contacted me about a visit to the Wabash archives for her students. A date was set and Linda Petrie and I started brainstorming on the sorts of things that we might pull out of our collection to share with these kids. 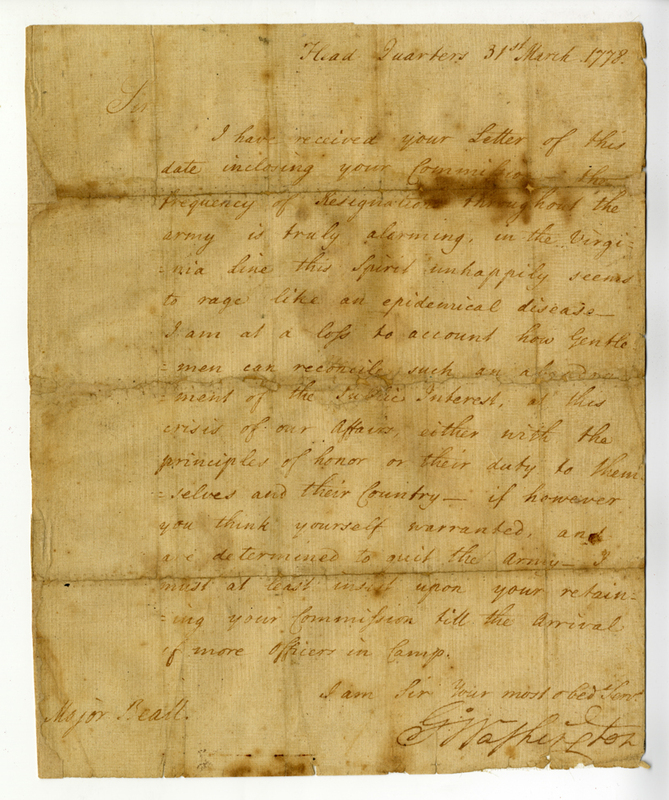 The letter from GW is a fascinating record in that it was written in March of 1778 in response to a resignation from the army’s officer corps. Here is a scan of this incredible document. For the visit, I really wanted to bring this letter to life for them. What could we learn about this letter? I created a handout for each student with a full color copy of the letter, a transcript of the letter and a short list of questions. 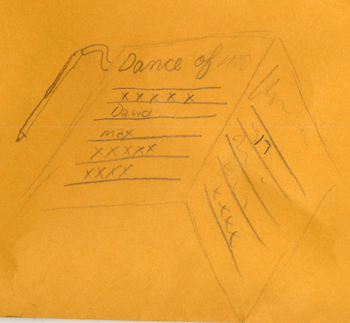 I have received your Letter of this date inclosing [sic] your Commission. The frequency of resignations throughout the army is truly alarming, in the Virginia line this spirit unhappily seems to rage like an epidemical disease – I am at a loss to account how Gentlemen can reconcile such an abandonment of the public interest. At this crisis of our affairs, either with the principles of honor or their duty to selves and the Country – if however you think yourself warranted, and are determined to quit the army – I must at least insist upon your retaining your commission till the arrival of more officers in Camp. I am Sir Your most Obed. Serv. Our first question to answer was, “Where was Washington’s HQ in March of 1778?” The answer was Valley Forge! We then discussed the writer, the recipient and the conditions in Washington’s army at that time. I asked the students to think about tone – what sort of mood was Washington in when he wrote this letter? Then we discussed word choice based on what I had just told them about the previous winter for Washington’s army, we noted the words “alarming”, “abandonment”, “crisis”, “quit”, and in particular the phrase, “…rage like an epidemical disease.” We agreed that these words tell us a lot about Washington’s state of mind at this time. Over the winter he had lost thousands of troops to hunger, disease and the elements. Today we might say he was at the end of his rope . It was quite a success! Each student had their handout, a pencil (this is the archives…pencils only please:~) and a good thick book to use as a lap desk as they sat on the floor. When they were finished with the GW portion of the visit, Linda Petrie (former government documents librarian and now working here in the Archives) directed them to stop a minute and look at the book they had been using as a desk. They were special too, she added. Turns out that Linda had pulled some Civil War bound government documents for the students to use. They had been nicely rebound in the not too distant past and looked like any mid-20th century library book. The students were delighted that they could hold old books and that this paper had been around since the Civil War. Wow! We moved to the next portion of the visit where we had set out two long tables full of other items for the students to see. Among these items were a Lincoln Civil War commission, a leaf of the Gutenberg Bible, dance cards with pencils still attached, postcards of Crawfordsville, old Wally Wabash, invitations to visit with the President and Mrs. Franklin Roosevelt at the White House and a Bible that pre-dates the King James version. We had so much fun sharing these odds and ends with these bright kids. 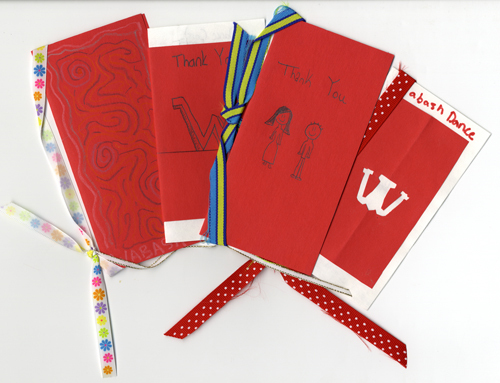 But without question, the best things to come from the visit were the thank-you notes from Mrs. Harris’ class. 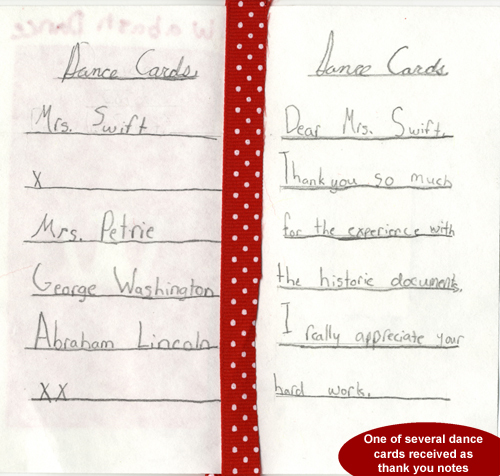 Clearly the dance cards made an impression as the majority of the thank you notes were created as dance cards. 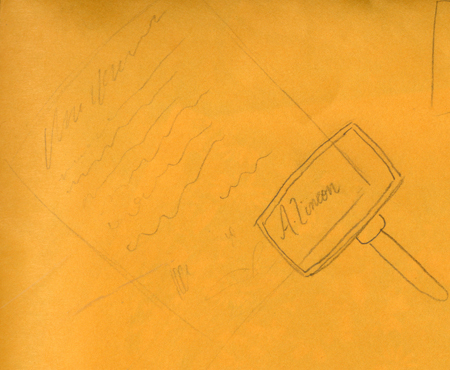 As you can see from this remarkably accurate drawing, we displayed the Lincoln commission along with our magnifying glass for the students to study the 16th president’s signature. Not just another picture, this is the signature of a budding artist. 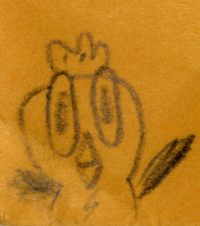 The young lady that drew all of these pictures is very fond of chickens and left this clue as to her identity. As you can tell, we had some fun that day. The students learned a bit about primary sources and how to untangle them and also that archives are not all dull and dusty. And, speaking for both Linda and me, the thank you notes were the icing on the cake! 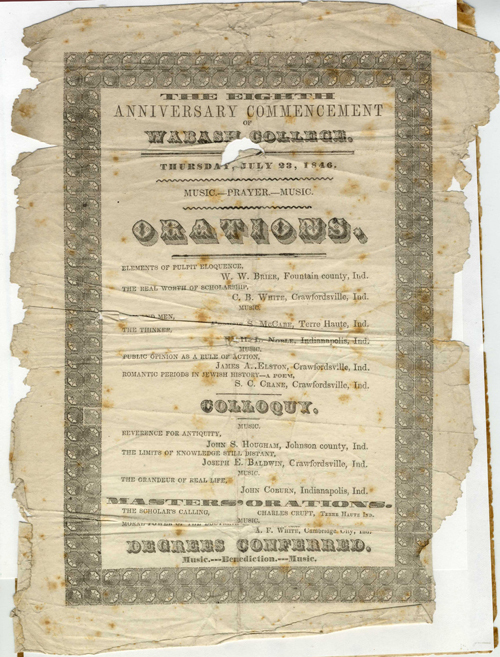 A couple of years ago we did an exhibit on Commencement at Wabash and we used this scan of the program for the commencement of 1846. As you can see, Commencement in 1846 was held on July 23. What a change, today’s seniors are out of here by mid-May! To better understand the timing of the school year here is an excerpt from the catalog of 1845-46, “The commencement is on the fourth Thursday of July annually. The vacations and terms for 1846 are as follows: The Winter term begins 1st of January, and continues 13 weeks to the 2d. of April, followed by a vacation of two weeks. The Summer term begins April 16th and continues 14 weeks to the annual commencement, July 23rd, followed by a vacation of nine weeks. The Fall term begins September24th, and continues 13 weeks to Christmas, followed by a recess of one week.” In summary students in 1846 were in class for 40 weeks a year. Student fees were very different at that time as well. Again from the catalog, in 1846 a student in the collegiate department was charged $8 in tuition per term ($24 per year). They could rent a room in the dormitory (the building we call South Hall, where Baxter Hall sits now) for $3 per term and they could expect “incidentals” of $1 for a grand total of $36 per year. The catalog continues with this next bit of information to prospective students, “The use of the Library is optional with the students. The charge for this is twenty-five cents per term. Board in private families per week from $1 to $1 25. Wood and lights, estimated per year, $3. Washing per dozen, 50 cents. Text-books in the Collegiate course, when procured from the Library, cost about $2 per year.” In summary, a collegiate student would expect to pay $86 00 for a three term year at Wabash. If money was no object another option was presented, “Lads, whose parents or guardians prefer, can be accommodated in the Professors’ and a few other families, where parental care will be taken of then, with board, room, lights, and washing, per week $1 75 – per year $70 00.” Including tuition this would bring room, board and tuition to $94 per year. In further description of student life, “The rooms in the College edifice are furnished with Franklin stoves, chairs, tables, and bedsteads. beds, bedding, and other furniture, the student will procure as may best suit his convenience. Every study-room has connected with it two bed-rooms, so that each student has a separate sleeping room. the bedsteads are designed for single beds or mattresses. Each suit of study and bed-rooms can be thoroughly ventilated.” Similar to the suite of today’s modern dorms, two students would have rooms either side of a middle study room. The three men who spoke at that commencement are notable figures in the history of Wabash. John S. Hougham was teaching at Franklin College, making scientific instruments on the side for additional money and would be the first president of a very young Purdue in a few years. Joseph Baldwin was the son of our beloved first president who died in service to this little college. John Coburn is a name known to generations of men who are brothers in the Beta Theta Pi fraternity as its founder. A pretty sharp group of alums that gathered in 1846. This is a tradition that lives on all these years later, although now at the Big Bash alumni weekend. A real highlight of the gathering is the alumni presentations over the weekend on topics as varied as forensic science and the brewing of a fine beer. So once again, I note that there is a great deal in the life of a small college that, though couched in different terms or updated with technology, remains the same. Colloquy lives on at Wabash every summer.